Sammy J and Randy have put on some amazing Festival shows both together and apart. Their solo shows really are different beasts. Randy’s shows are still hilarious and full of surprises, but they tend to be more soulful and philosophising about life with the odd whimsical touch. Anti-Crisis was a show born out of illness from last year. Some of you may remember that the majority of the run of Sammy J & RandyLand had to be cancelled. Randy had a bit of a rough year and plenty of time to lay in bed wondering what it is all about. He’s discovered the religion of Berylism and is high up on a huge pulpit sharing his revelations using the Big Book of Beryl, the text of an intergalactic missionary. A show that quiety explores faith is appropriate through the Easter season but it’s about much more. Beryl’s theory of creation happens to mostly coincide with modern scientists, except that it is also pretty silly and depicted through stunning back projection and shadow puppetry. Randy always loves to surprise and awe his audiences with big prop change revelations and there is a good one here. Here is the spot where I must say that Randy, the comedian is a puppet. You will be a little hard pressed to find out the name of the puppeteer. I know because I’ve been a fan from the beginning. His name is never on any of the Festival advertising and it was nowhere to be found in the Ricketts Lane credits or on the ABC site (though a bit of further research helps). Randy truly has attained fame as a standup comedian in his own right. Anti-Crisis plays with this somewhat and has fun teasing us with possible peaks behind the curtain. If there is one thing that you can count on, it’s that Randy will always put on a fabulous show, with shrewd and witty insights, hilarious jokes and magical surprises. He will never stop being that foul mouthed puppet we love, but his solo shows have more depth and warmth than you might be expecting. Highly recommended, as always. 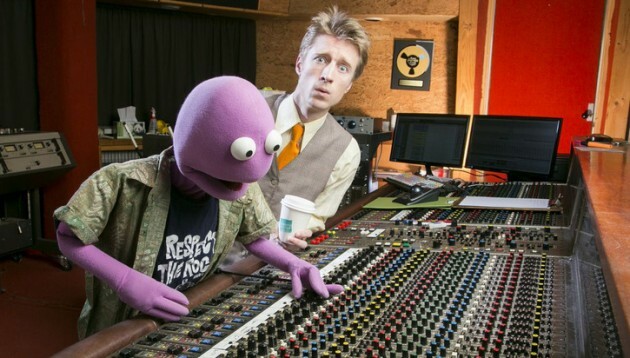 A skinny man and a foul-mouthed purple puppet, Sammy J and Randy are a rude and riotous musical comedy duo with a big history in Australian comedy. 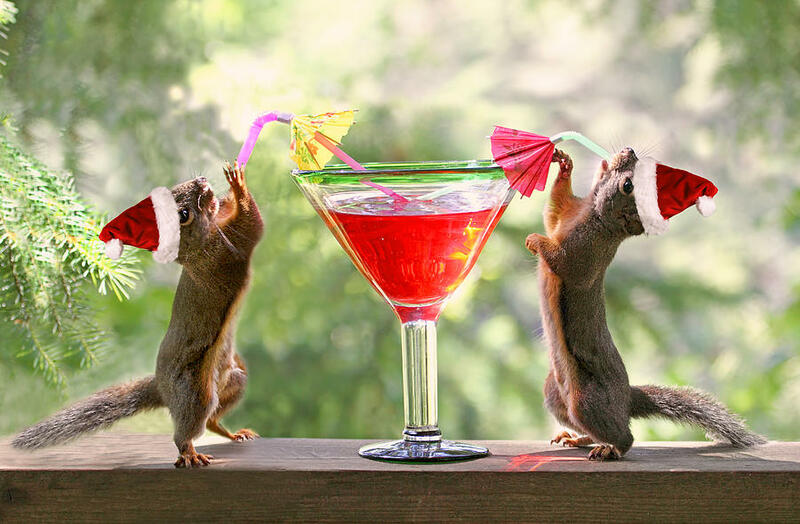 They’ve staged hugely successful narrative shows in various festivals, covered political issues both on stage and television, won The Barry Award (named for Barry Humphries) at the Melbourne International Comedy Festival and have created and starred in their own sitcom (Sammy J & Randy in Ricketts Lane). They are currently on tour in the UK and I was excited to see them perform in London. The Mix is a huge white tent in Russell Square Gardens with half of the interior taken up by a stage which was so massive you’d need a full orchestra to fill the space, so a small covered table (Randy’s hut) and Sammy J’s keyboard were completely overwhelmed. Sammy J described the tent as like being inside a huge marshmallow. Basically the space was entirely unsuitable for a comedy duo, they did the best they could but the venue really didn’t help to create atmosphere. Oh and the stage was over a foot off the ground and the audience were all on those little folding chairs on flat ground, so looking up the entire time as well. Not the best circumstances for the debut appearance of Sammy J & Randy in London, but they managed to keep the audience entertained and please their fans. It might be surprising to think that they have so many fans at their first London show but as they learned in a little quiz near the end, their fame has preceded them. About half the audience claimed to have seen their TV series on Netflix. The part of the audience who were new to them were a little nervous at first (what with all the jet-lagged abuse of the audience, general swearing and saucy dance numbers) but you could feel them getting into the joyfully unhinged, anarchic show fairly quickly. In the past Sammy J and Randy have done shows with plots, but this was more like a Best Of show and thus is a great introduction to their work for Londoners. There was no real structure as such, apart from the songs, most of it was about being in London, problems they had getting through customs, not knowing local cultural references and bickering. I felt sorry for one particular audience member who had an unexpected cameo late in the show but looking back, you can see the crafty set-up, and at the same time, appreciate that it led to a great surprise finish. The hilarious songs (including ‘When Sammy met Randy’, ‘Metaphor Off’/ ‘Love Song’, ‘Sammy J and Randyland’) and demented interplay were well executed and the hour flew by, with the audience giving a rousing extended ovation at the finish. If you’re new to Sammy J & Randy, I can only describe their songs as being of the twisted love and betrayal genre, with a lot of quite intricate wordplay (some of which was sadly lost due to the booming sound system drowning out the lyrics at times). There was a little romance on stage, as well as a Titanic-style dance move and some wacky props. One of the highlights of the show had to do with their CDs. Apparently when coming through customs, Sammy J forgot to say the 400 CDs in his case were for “promotional purposes” and instead he jet-laggedly said “they’re to sell at gigs” and thus they were (almost) all confiscated. An extra reason to spend some money and support their UK shows (or watch them on Netflix – or both). Sammy J and Randy’s shows are not for the kids, the easily offended or the faint of heart (especially considering the theme of the final uproarious number), but if you want a hour of friendly filth and hilarity then why not end your lovely sunny Saturday in London at Russell Gardens having your funny bone “tickled”. An Evening With Sammy J & Randy is being performed in London as part of the Just For Laughs Festival (July 20-23), Yorkshire (July 25-27) and Dublin (July 29 & 30). 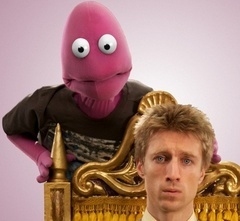 Sammy J and Randy the puppet are back this Festival, with an all stops removed adventure in comedy. There’s nothing like a tour to test the friendship of the most resolute duo. In this performance we hear of the phobias, the tricks, the grievances and the good times Sammy J and Randy have experienced in this; their difficult first album tour. You can expect a delightful cocktail of the Sammy J and Randy branded duets, banter, and audience interrogations. 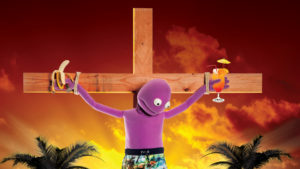 Randy the puppet, with his purple tampon-shaped head and exasperated persona has been friends with Sammy J since their unemployed no-hoper university days. Sammy J, upright, clipped, and besuited, takes to the keys, his trusty juice box always within reach. The two challenge traditional ‘straight man, funny man’ formulas – both taking turns to challenge the patience of the other and the direction of the show. The two flirt with Randy’s identity as a puppet- sometimes destroying the illusion, sometimes pushing it to new (naughty) levels. The dexterity with which the two perform is phenomenal; it was sometimes easy to forget their was a man operating Randy from beneath the curtain (spoiler). Randy’s physicality is pretty amazing; transcending Sesame street norms, and wandering into delightfully adult territory for a puppet. The many musical numbers are a highlight in this hour. Themes wander all over the place into deliciously original material; the existential angst caused by the census being an example . The only criticism that could possibly be made is the claim to have achieved nothing with their lives was at odds with the salubrious grandeur of the Forum from which they performed to an adoring audience who had packed out the venue. This is an exceptionally tight performance. Fast paced, furiously cheeky and very witty; get along to this packed hour of entertainment before the end of the festival. Carrying on the journey of their last two shows together (2010’s Rickett’s Lane and 2011’s Bin Night), The Inheritance takes our self-centered no-hopers to Britain in the wake of Randy’s uncle dying and leaving him with unexpected riches. A tale of secrets, debauchery, jealousy, mistaken identity and murder unfolds. There’s a series of twists in the saga, so I won’t go into great detail, but it’s a great little story that they’ve woven together. The stage design and puppetry have taken a step up from the last few shows, especially the delightfully grotesque groundskeeper. While not quite at the level of production of Forest of Dreams, it’s unlikely that you’ll find a more impressive production in the festival. Heath McIvor’s skill as a puppeteer is really showcased here, and it’s a delight to see such an under-appreciated art given an outlet. Sam and Heath seem really comfortable in their characters here, and their ease on stage allows them to really enjoy themselves. Even with such a tightly scripted show incorporating musical numbers and constant stage changes, they’re both relaxed enough on stage be able to break out of the show when the opportunity arises. This sense of fun is infectious, making it impossible not to get caught up in the enjoyment of the performers. This show is probably a good re-entry point into Sammy J and Randy for those that were brought in by Forest of Dreams but were shocked away by the darker more misanthropic nature of the characters of recent years. The edge is all still there, but there’s an extra level of charm in this show that makes it much more accessible. Sammy J and Randy are on a great little journey together, and this show is a great opportunity to get on board and see where else they’re going to take us. Sammy J & Randy perform The Inheritance at Forum Theatre downstairs.